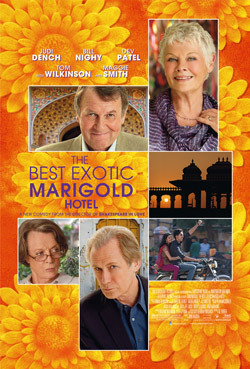 Best Exotic Marigold Hotel Movie Trailer. Judi Dench, Maggie Smith, Tom Wilkinson, Bill Nighy and Dev Patel star in the comedy based on the novel by Deborah Moggach. Watch the movie trailer below. The story follows a group of British retirees who decide to “outsource” their retirement to less expensive and seemingly exotic India. Enticed by advertisements for the newly restored Marigold Hotel and bolstered with visions of a life of leisure, they arrive to find the palace a shell of its former self. MPAA Rating: (PG-13) for sexual content and language.